One problem with woodburning stoves is that a lot of the heat generated goes immediately up to the ceiling and is not distributed into the living area closer to the floor. A woodburner fan is a device designed to help circulate the heat from a woodburner evenly around a room, thereby reducing the amount of fuel needed to maintain the room at a comfortable temperature. There are fans available which need a mains connection, but that is not very efficient, and it requires ugly cabing etc. The Ecofan range are a selection of fans designed to be mounted to the top of woodburners which need neither batteries nor a mains power connection. Instead an Ecofan is powered by a thermoelectric module which generates electricity using the heat differential between the base of the module in contact with the woodburner and the top of the module which is maintained at a lower temperature thanks to its connection to cooling fins. This type of thermoelectric generation is known as the Seebeck Effect. With the fan positioned as recommended (and shown above), the base of the fan gets very hot, but the temperature of the cooling fins is limited by (relatively) cool air flow. The hotter the wood burner gets, the faster the fan spins. 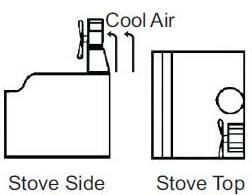 If the fan were to be fitted in front of the stove pipe, then the cooling fins would be hot and the temperature differential would be low resulting in poor performance. Two different Ecofan models are available – the Ecofan 800 rated to push 100 cfm (cubic feet per minute), and the larger Ecofan 802 rated to push 150 cfm. These two models are available with either gold or nickel coloured blades. 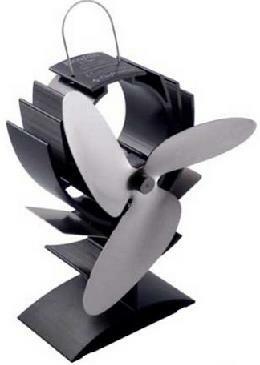 The full range of Ecofans and their accessories and spare parts are available here: Ecofans. 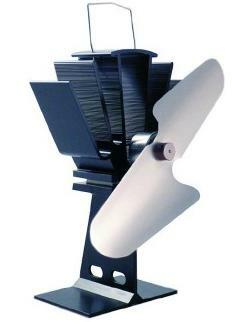 User manuals for these fans are available for free download here: Ecofan 800 User Manual, Ecofan 802 User Manual.